Take a second look at this bottle koozie – there’s more than meets the eye. No longer must you close beer or bottle when ordering koozies. This combo koozie covers whatever is on hand. Made from the same materials & technologies as the beloved Yeti, Atctic, & Ozark tumblers, this koozie keeps beverages icy cool. It it looks pretty sweet too! 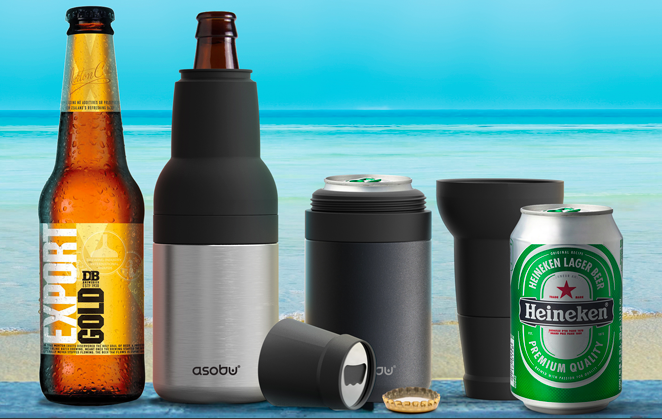 It covers a can or a bottle – and has a bottle opener enclosed in the top! Although this is a no-brainer for summertime marketing & promotions, holiday gift season is right around the corner. These fit right in with the upcoming oyster roasts & bonfires coming up this fall. Use these as gifts for your clients and your staff! How would I use this in my marketing? In addition to a great holiday gift, this piece would fit well within a retail space or product launch for outdoor & recreational stores, brewery retail, swag-bags, and works well as an incentive gift i.e.. “sign-up to receive” promotions. Art & design is key in any piece. Consider not just adding your company logo, but working to create art that inspires, is humorous or nostalgic, with your logo or site placed in a secondary spot. The recipient will always remember where and when they received great swag. Like Angus, always prepared for adventure.